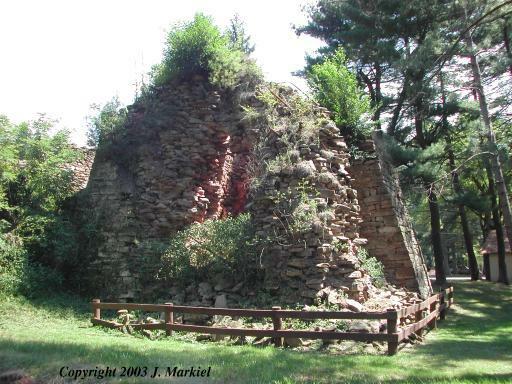 Paradise Furnace is one of the crudest built iron furnaces seen to date. 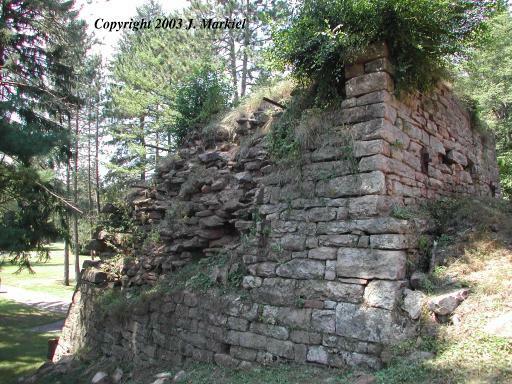 The nearby hillside is littered with the small, flat stones utilized to build this furnace. 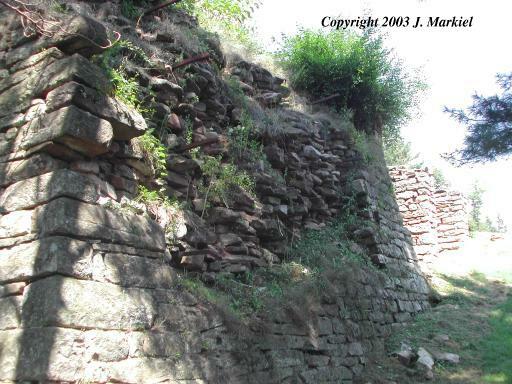 It was clearly built by merely stacking up the local stones, without benefit of any binding agent. 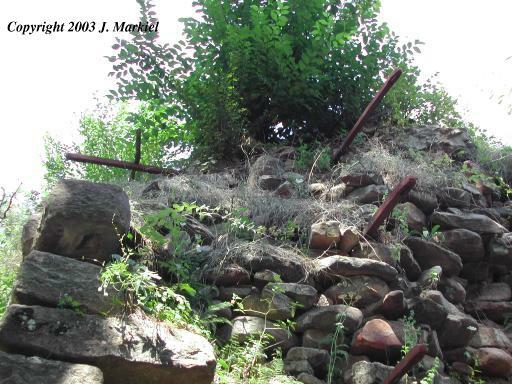 Iron bars were inserted at strategic locations to hold the structure together. The furnace is currently in poor shape, with most of the inner stack and left side fallen in. 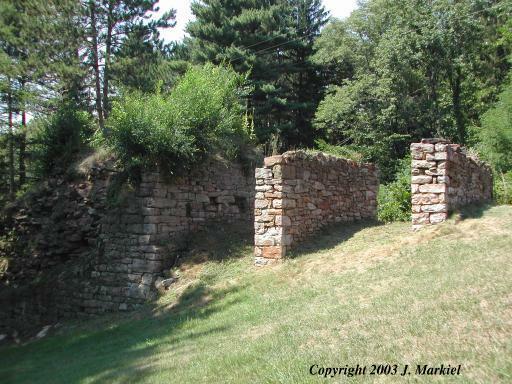 The area surrounding Paradise Furnace was a center of local industry. In 1780, the first colonist, Nicholas Crum, built a gristmill. A bloomery followed in 1790 that produced about 100 pounds of iron per day. 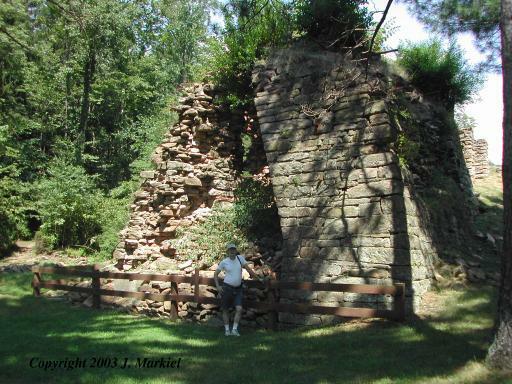 Nearby Savage Forge was built to turn the cast iron from Paradise Furnace into wrought iron. Of other interest, it is reported that Edgar Allen Poe visited the region in 1870 and wrote his famous poem "The Raven" after seeing the many ravens that nested in the nearby cliffs. The rear of the furnace indicates a series of stone supports for the charging ramp. 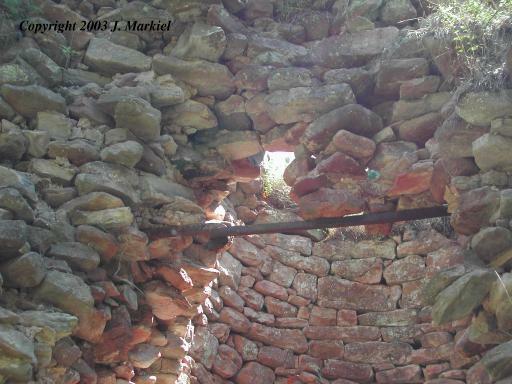 This is one of the few furnaces identified so far that was built in this manner. Most were built against a steep hill. It is not clear how the blast mechanism operated for this furnace. 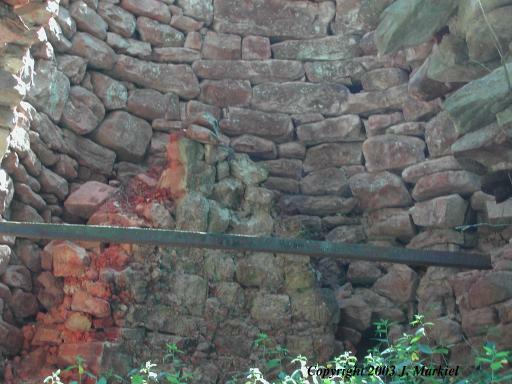 The creek to the left of the furnace stack is extremely small and could not have been utilized to drive a water powered system. The most probable scenario is that the furnace utilized bellows to force air into the system. Located in the Trough Creek State Park, just east of State Rt 994, on the south western edge of Raystown Lake. The Pennsylvania State Parks operates a website at Trough Creek.